While looking for certain images this morning, archives staff came across this fabulous photo of what is now Woods Memorial Hall in the 1886 Olla Podrida, just after it was built. There would have been four Circle houses with it (out of frame, to the left) at that time — Cleve, Griswold, Dickinson and Woodhull — but not Kennedy, which was not built until 1889. Other buildings constructed that first year include Foundation House and the Bath House. Missing, as you can see from the photo, were Upper (built 1892) and the Edith Memorial Chapel (built 1895). Memorial Hall, the main classroom building of the day, was designed by Peabody & Stearns, a leading Gilded Age architectural firm from Boston. 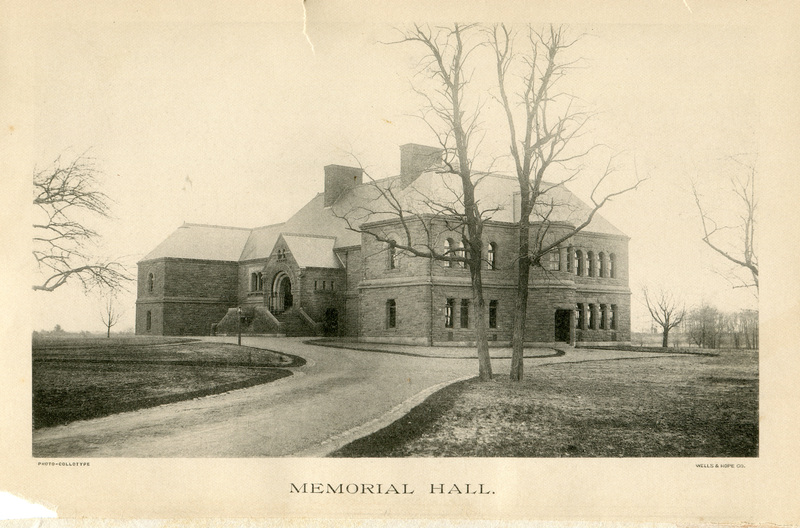 Memorial Hall, built in 1885, from the 1886 Olla Podrida yearbook.